The cost of diesel fuel in Canada — the se-cond largest component of operating cost for trucking companies and the largest operating cost for independent operators — continues to escalate in Canada. By the third week of March, the rack price of diesel fuel, which is a reflection of wholesale prices before taxes, was up by almost 36% on a year-over-year basis. Since the beginning of 2001, only 15 months have recorded larger year-over-year gains. The impact on carrier margins is signifi-cant. Generally speaking (and depending on the type of operation/equipment/load factors), every penny increase in the price of diesel fuel per litre adds a cent to the average cost per mile to operate a truck, or $700 to $1,000 per year per truck. While it would be easy to point to recent politi-cal unrest in North Africa and the Middle East as the reason for much of the recent escalation in prices, the fact is that the current upward advance in fuel prices has been underway since the summer of 2010, long before the problems in that part of the world started. One way of smoothing out the month-by-month fluc-tuations in fuel prices is to use moving averag-es to highlight the underlying trends in fuel pric-es. Using a 12-month moving average (see chart on right) it is evident that the current up-ward trajectory of diesel fuel prices reflects a longer-term trend. 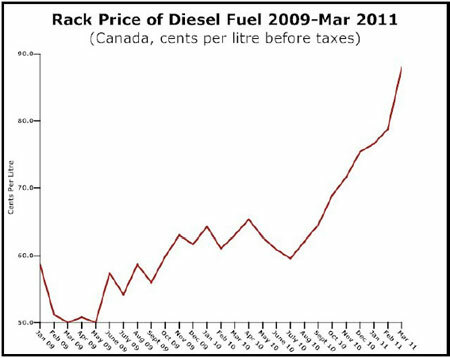 Even using a 12-month moving average the year-over-year increase in the rack price of diesel fuel from March 2010 to March 2011, is almost 20% (19.2%) on a national average basis. While it is difficult to forecast with certainty where fuel prices will go in the coming months, even if the cur-rent uncertainties around the political situation in North Africa and the Mideast abate, economic recovery will provide an underpinning for further upward pressure on fuel prices. But that’s not all. If the Government of Canada follows through on its plan to introduce a national biodiesel mandate slated to start in July 2011, this will precipitate further increases in diesel fuel prices. Even the government’s own Regulatory Impact Analysis Statement published in February 2011 admits that. The only question to be answered is: By how much?